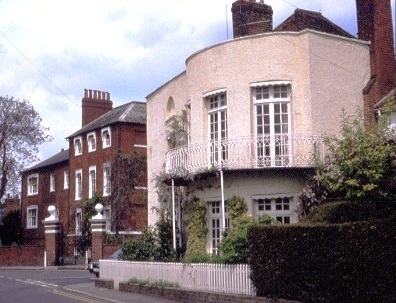 These two houses, together with the site of Park Villas next up the High Street and Datchet Lodge on the opposite riverside corner, were all owned by James Haydock in the 1770s. 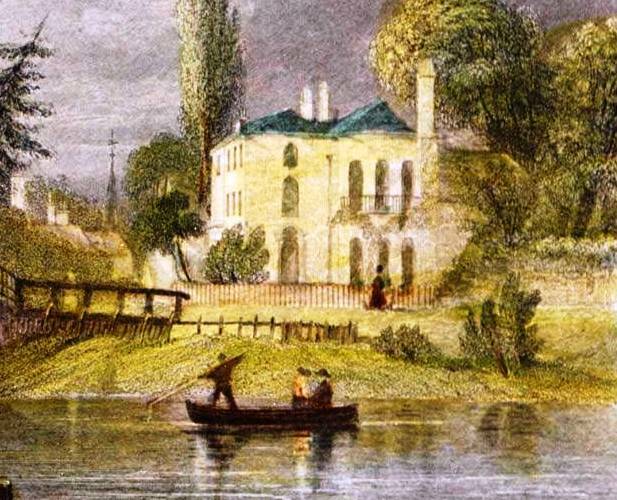 He built Datchet Lodge on the ancient ferry land site (made redundant by Datchet Bridge in 1706), which he leased from the Duchess of Buccleuch, and was almost certainly responsible for also updating Old Bridge House in the fashionable style of the time. The ownership history of the whole group is very complex and confusing because the legal paperwork for all four properties have settled in a large bundle at Old Bridge House with little indication as to which deeds might refer to which purchase, inheritance or property. The earliest deed, cited as from 1575 but no longer existing, could refer to either Old Bridge House or to the Post House and the history of these properties is one of the most difficult to interpret in the village. The Trust set up after James Haydock’s death still owned and managed all these properties into the 20th century, so that those who are identified as living here in the eighteenth century were tenants rather than owners. 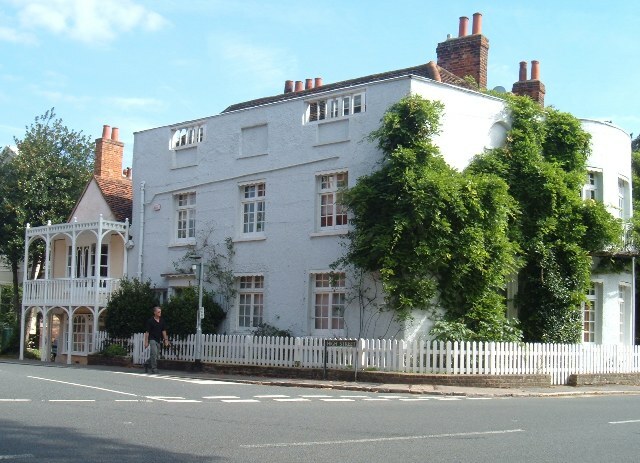 Of particular interest is an early 20th century artist, Alice Fanner, who lived at the Post House, but there is no evidence at all for the story about Nell Gwyn living at Old Bridge House. These two houses are very closely interlinked, partly sharing their original 16th or 17th century timber frame. Until recently the whitewashed Georgian-style facade of the main house concealed the Tudor gable of the smaller one (see photo left) but after restoration work the older feature was left revealed. 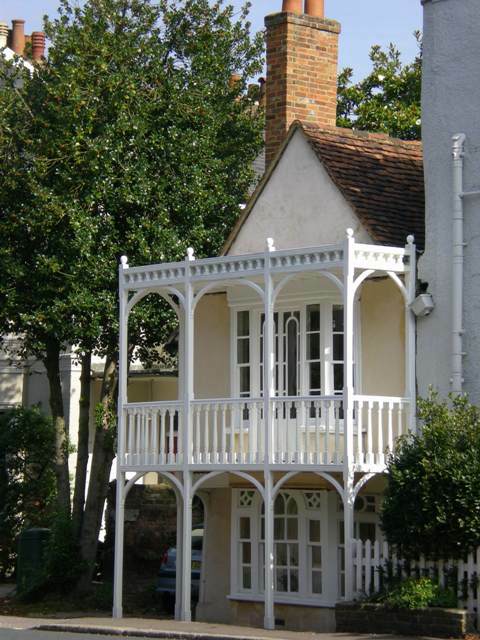 This has created a clearer sense of it being a separate house and complements its very attractive Regency balcony. Neither of the present house names are original or of any great age. The name Post House is first listed around 1950 but there is no evidence for any connection with either post horses or the mail; in the late 19th century it was known as The Retreat. The larger houses’s name arises from its close proximity to Datchet Bridge across the Thames from 1706 to 1850. 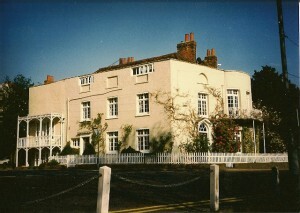 Bridgefoot was used in the 19th century followed by Riverview until the 1920s when it was first listed as Old Bridge House. The relationship between the two is unclear; sometimes they are treated as two and sometimes as one dwelling. For some years in the 18th century (and probably earlier) some part of the property was an alehouse called the White Horse. One of Datchet’s persistent legends is that Nell Gwynn was lodged here by Charles II, but the story is almost certainly a fabrication. The number of houses across the country where Nell is reputed to have lived rivals the number of beds that Elizabeth I is said to have slept in. There is not a scrap of evidence for the story, quite apart from the fact that she owned a substantial house in Windsor and was never ‘hidden away’ by the King as this legend claims. However, it is true that Charles knew Datchet well and that Nell would also have been seen here frequently. The main first floor room in Old Bridge House is panelled and has a marble fireplace in the French style which may have encouraged the telling of the story, but this decor dates from the late 18th century rather than from the late seventeenth. 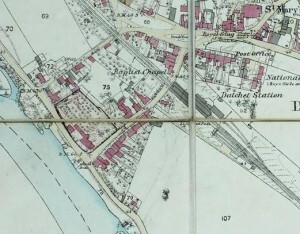 In comparing these two details it can be seen that by 1899 the Post House has been considerably extended to the north side and to the rear and has been clearly divided from Old Bridge House by a new property line running through the houses and gardens. 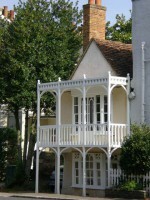 Old Bridge House has also had a narrow extension added at the back. The later surveying was more accurate than the earlier one, and all three versions of the Enclosure map show slight differences in the footprint of these houses. The original core of the Post House was very small indeed. In 1901 at The Retreat the census listed Arthur Edward Taite (age 40, a South American merchant & buyer who was born in Australia) and his wife Alice Fanner who is described as an artist & sculptor, working at home on her own account. 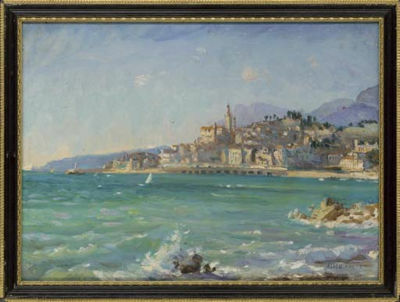 Alice Fanner (1865-1930) was a reputable painter whose work, mostly seascapes, still sells well. She lived in Cornwall, London and Essex as well as painting in Europe but she and her husband also spent about ten years here, their last listing in Kelly’s Directory being 1901. 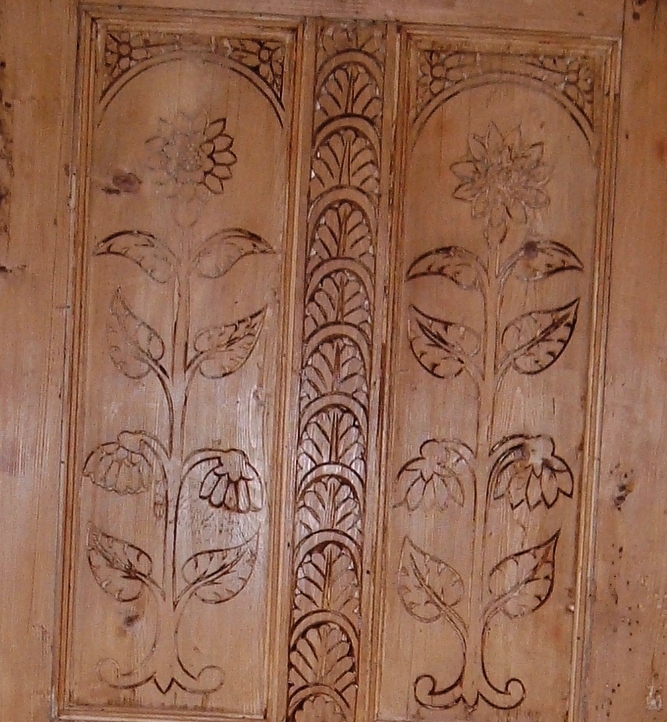 But Alice did not only paint; she described herself on the census form as ‘artist and sculptor’ and her presence must surely account for the decorative wood carving in the Post House which has long been a puzzle. 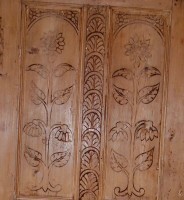 Doors, staircase and wall panelling are covered in stylized flower patterns, reminiscent of the Arts and Crafts movement, a period which fits very well with the dates of Alice’s time in the house. The Misses Sturges were the last descendants in the village of a wealthy family who had lived here since about 1750. William Sturges the younger, father of the Old Bridge House ladies, owned shares in the mining and ironfoundry business of John Sturges in Bradford (described in his will of 1811). This Sturges family was related by marriage to the Binfields of Datchet which accounts for the use of the name. None of William and Jane’s daughters married themselves, so that they were the third set of three spinsters in the High Street during this period, alongside the Gibbs of Clifton House and the Newmans of St Helen’s Cottage. They do not seem to have lived here before about 1840 and were previously at Cedar House in Horton Road, owned by Josiah Early who was probably William Sturges’ grandfather. Rebecca Sophia youngest daughter died 1882 age 81. Jane was not baptized in Datchet although the others were. 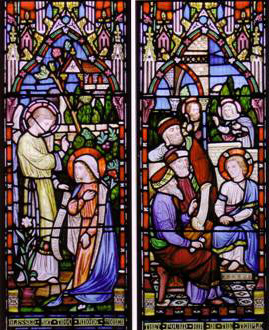 In 1865 Jane Binfield and Rebecca Sophia took a new opportunity for a family memorial by dedicating a lovely painted glass window in the just rebuilt parish church. The village’s wealthy families were demonstrating their status by providing glass in the 1860s, all from just two glass-making firms. The Sturges window is at the east end of the south aisle and represents the Annunciation and Christ found in the Temple. It is by Lavers & Barraud, dated 1865 and retrospectively commemorates their father William (1760-1811) and mother Jane (1762-1835). James Haydock died in Datchet in 1802, aged 65, and his memorial in the church describes him as an inhabitant of the parish for thirty years; his wife Barbara died ten years later, aged 73, having been a resident for 41 years. James had bought his several properties in the village between 1773 and 1776, though Datchet Lodge was built by 1774, and carried out major alterations at Old Bridge House and the Post House in the next few years. Land Tax listings, starting in 1781, record both owner and occupier so that we know the Haydocks lived at Datchet Lodge themselves until Barbara’s death, while Old Bridge House and the Post House were leased to frequently changing tenants. By 1825 both houses were in the occupation of the Revd Champnes (Champneys?) vicar of Slough. The Haydocks had no surviving children and their heirs were Joseph Boardman (who was required to take the surname Haydock) and Philip Darrell of Cole Hill in Kent. These two both died before Barbara and the inheritance passed as a Trust to the next generation who lived in Cole Hill rather than Datchet. The first of these images is usefully dated as 1774, showing the second Datchet Bridge which was built in 1770. The other one is not dated but a church spire can be seen (by artistic licence) at the top of the High Street and St Mary’s did not acquire one until sometime after 1787, so the date is pushed forward to around 1790. The listed building description of this house describes the facade with its Georgian bay windows as 19th century and that of the Post House with its pretty Regency balcony as early 19thC, so perhaps around 1790 is plausible. Clearly Datchet Lodge was built earlier and was a much higher status house, a new build in an entirely fashionable style which took full advantage of its position on the riverside corner, here seen dramatically from across the river. A convenient house in good repair, containing two front parlours commanding a view of the bridge, a breakfast room, a good kitchen and wash house, four good bedchambers and back room, with a neat garden well stocked with fruit trees. A valuable estate, part copyhold and part freehold, desirably situated in the pleasant and admired village of Datchet, comprising a modern genteel residence with garden near the bridge commanding delightful views of the river, park and garden.Also a comfortable cottage retreat with large garden adjoining the same, and seven smaller cottages with gardens and yards, altogether presenting a desirable spot for the forming of an elegant and spacious residence. This advert refers firstly to Old Bridge House and then to the Post House as a cottage retreat, which later became its name. The seven cottages being offered as a spot ripe for development is the site of Park Villas. The seven other cottages were not demolished until about 1850 when two elegant and spacious semi-detached villas were built in their place. This attempt to sell the estate was not successful, or was withdrawn, and it remained in the hands of the Haydock heirs whose legal wrangling and disagreements are detailed in the surviving paperwork but do not add anything to the history of the house or its occupants. As the table above shows, the premises were officially licensed from 1735 to 1767, although absence of a licence doesn’t mean ale wasn’t being sold. The house which Thomas Bampton bought from Lascelles in 1723 was described as a messuage called the White Horse, which implies it was already established as an alehouse. It remained so through the next purchase, by Edward Jagger, so it is assumed that the new owners were not living there themselves but leasing it out as a pub. There were several inns or alehouses in the High Street as well as the White Horse: the present Manor Hotel, the White Hart on the corner opposite and The Rose at Mrs Partington’s Hat Hire shop. They were probably catering to those passing along the High Street to and from the ferry or (from 1706) the bridge. Edmund Mason was a Commissioner for the Navy and married Elizabeth Jagger (daughter of Edward) in London in 1742. He already owned a house (long demolished) in Horton Road near The Lawns as well as acquiring this property in 1752 from his father-in-law. In 1773 he was one of the victims of the scandalous poisoning of the Colnbrook Turnpike Trustees. The Trustees (all local men of considerable wealth and social standing) had met for their annual dinner in the Castle Inn at Salthill, Slough, after which five of them died of a sudden severe illness. Five others recovered and only one was unaffected, while conflicting theories spread alarm across London and the country. A sick pauper was blamed by many but the truth was only revealed by the landlady Mrs Partridge on her deathbed; the turtle soup had been left standing overnight in a copper pan and although it appeared green in the morning no one had understood the dangers of verdigris poisoning. 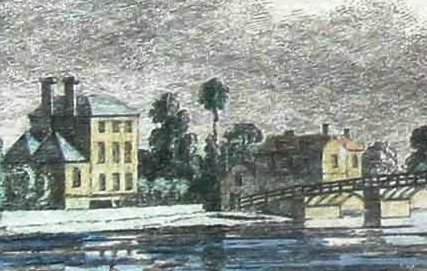 Haydock’s 1776 purchase from Joseph Peto of a freehold barn, stable and ½ acre land by the ferry with the dwelling house built thereon presents a problem. This description had been used from1575 to1639 (see table below) but with no further transactions recorded until sold to Haydock by Peto. However, it was cited in a sale agreement of 1854 as proof of freehold title to Old Bridge House and the Post House, together with the 1773 and 1775 copyhold titles to the Park Villas site and the White Horse house (which itself must be one of Old Bridge House or Post House). It is likely that the two houses had completely different histories even though they have become so closely related to each other. Both have been so much extended and altered over centuries that it would be impossible to establish the original sizes and relationships, but the Post House is likely to be the earlier of the two due to its small size. Perhaps, if any of the descriptions can be believed, Edward Jagger (owner 1726 to 1752) built or rebuilt Old Bridge House since the property was described as ‘now two houses’ when he sold it in 1752. The copyhold sequence of owners by which James Haydock acquired Old Bridge House or the Post House and the Park Villas site in 1773 and 1775 leads back to Edward Lascelles (see White Horse alehouse table above). He was a London merchant related to the Lascelles of Harewood who had in 1709 inherited a huge estate of land and houses scattered throughout Datchet. It originated in the acquisitions of Christopher and Robert Barker, printers to Queen Elizabeth, from the 1590s. The core of the estate was at Southlea, where they may have lived at the (demolished) Southlea House, but the Barkers had also bought every dwelling or piece of land which became available over about twenty years. Robert had overreached himself as he did in every walk of life (see separate Barker family article on this website) and before his death in 1645 the estate was mortgaged to one of his sons-in-law. When after a series of sales and bequests the estate came to Edward Lascelles he seems to have rationalised the holdings. Within a few years he sold off those houses and cottages which did not have land attached, particularly several in the High Street which can be followed in the Manor Court Rolls; land was valuable but cottages needed keeping in repair. Among others, the Park Villas site was sold by Lascelles in 1718 and was eventually bought by Haydock after a series of owners in 1775, and Old Bridge House (and / or the Post House) was sold by Lascelles in 1723 and bought by Haydock in 1773. While it is clear that these properties were part of the Barker’s estate there is no evidence that they actually lived in any of them. In fact, being sold off by Lascelles implies that they were of little status or interest to him. 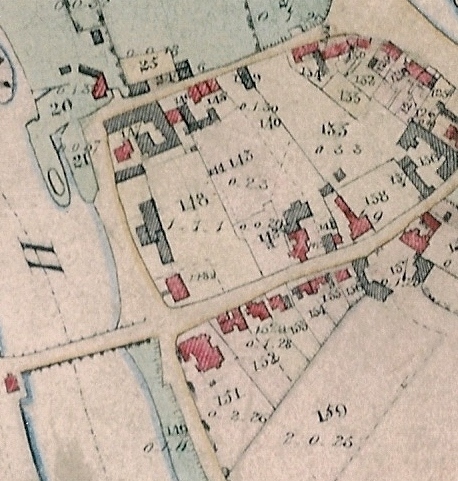 At the time of Christopher Barker’s original purchase it is possible to identify the major land holdings but these High Street houses were described merely as a cottage in Stoney Street (an early name for the High Street) and it is not possible to distinguish one from another. All it is possible to say is that houses existed on these sites at least by the 1580s and probably for centuries earlier since the High Street led to the important focus of the Thames ferry to Windsor Castle. 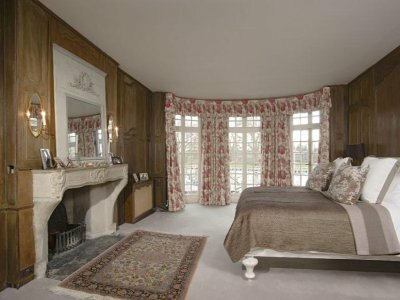 For the earlier history of this house we rely on the records of Datchet Manor. The manorial system was based on the feudal view that all land and property technically belonged to the Lord of the Manor and through him ultimately to the Crown, with all transactions dealt with by the Manor Court. The minutes of the court’s proceedings (Court Rolls) detailed all sales and changes of ownership or tenancy, so that if a property can be identified at all a complete record may exist from the mid 16th to the late 19th century. 1) Freehold, by which a payment (a heriot or fine) was due to the Lord when a sale took place. Very little information was required or recorded at the Court session and the full deeds were held by and passed on through the sequence of owners. Freehold properties are thus difficult to track unless a full set of deeds are still in existence, usually in private hands but sometimes deposited by lawyers at their local Record Office..
2) Copyhold, by which a property was held by a copy of the court proceedings, not a full private deed. The system was that every time a copyhold owner died, inherited or wanted to sell, the property was formally ‘surrendered’ back to the Lord and then, with due ceremony, the next owner was formally ‘admitted’. Each transaction of a copyhold house or land (such as part of this property) was accompanied by a description which seldom changed over the centuries and so can sometimes, with luck, be tracked back and forward. The Lords of the Manor took all the Datchet manorial paperwork with them to their main residence when their ownership ended. This was Boughton House for the Buccleuchs who later deposited the material at their local Northampton Record Office, and Beaulieu Archives for the Montagus. Early 19thC front but probably once continuation of 16thC frame of Old Bridge House adjoining. Two storeys, roughcast with high parapet & old tile hipped roof. !9thC two-storey three-bay timber balcony with flat roof over, chamfered posts with ball finials, turned balusters to balcony at first floor. Curved braces under balcony with moulded bases, returned on ends. Sash windows with glazing bars on wall behind?century colour-washed brick building at rear connected to front by a timber framed cement-rendered coeval wing with early 19thC ground floor closed porch & two first floor casements. Interior much modernised & altered. House included mainly for group value. 19thC fronting earlier timber framed house, reputed to be built 1558. White washed pebble dash with parapet & hipped old tile roof. Two storeys, three casements with wood transoms, south front on right hand & segmental bow with first floor case iron balcony. Wood doorcase of narrow panelled pilasters & entablature with dentil & modillion cornice. Upper half of door glazed with glazing bars, lower half has two flush panels. South front has unusual three-centred arched doorway with ‘Gothic’ fanlight & surround of clustered half columns, cornice with fan & pendant motif derived from vaulting, open dentil pediment. Wood band between fanlight & door fluted with quatrefoils at intervals. two dormer windows behind wood balustraded panels in parapet. 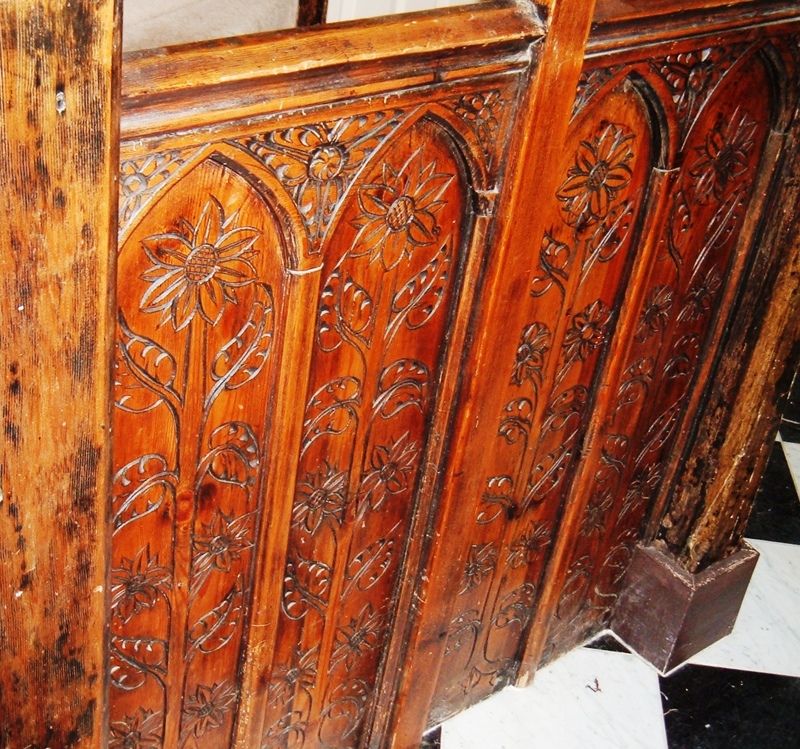 Interior has hall-like room to rear incorporating earlier timber beams & carved bosses, now used as brackets. Large open stone fireplace with chamfered oak beam over. Door to same is original with linenfold panels & is probably in original position. Dining room has a simple reeded frieze. First floor bedroom has late 18thC timber panelling of French design & stone fireplace of similar period.